Atha Yoga Anushasanam. Right here, right now, in this moment, we begin. 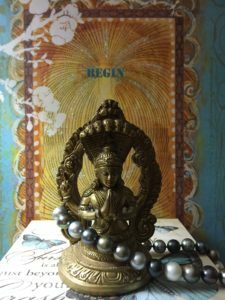 We take up the path and the teachings of Patanjali’s yoga sutra pearls. We roll them around in our mouths, extracting the nectar of wisdom for our daily lives. Chrysalis: Quiescent, sheltered place of preparation, growth and transformation. 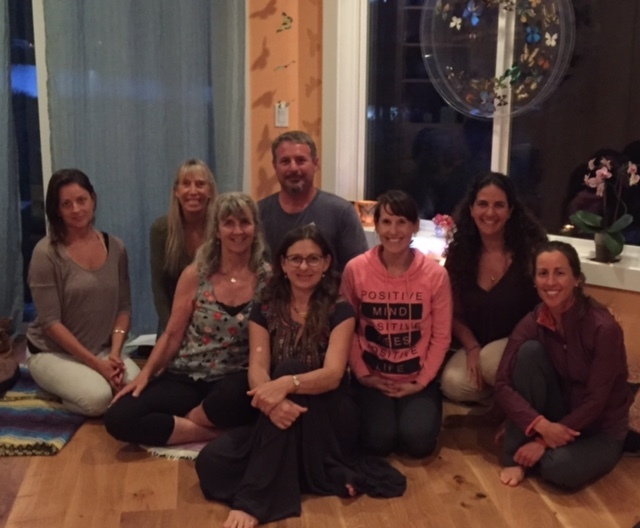 The Chrysalis Studio had its initiation and first satsang with blessings by my teacher, Bhavani Maki and gathering of our sangha. June 29, 2017. Bhavani blessed the Chrysalis studio with sage and aarti as we chanted the Gayatri Mantra and then the Shantih Path (Teacher-Student Mantra of protection), before diving into the Sutra. Sherry talks with Drs. 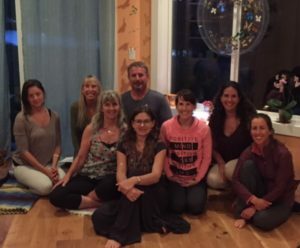 Gloria and Heidi Horsley about Signs and Synchronicities on the Grief Journey. Aired February 26, 2015. 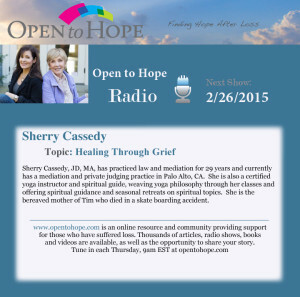 Sherry appeared on Grief Relief TV in June with Drs. Gloria and Heidi Horsely to talk about Grief and Spirituality with guest Faith Freed, author of IS, Your Authentic Spirituality Unleashed. Sherry talked about her experience of loss that has shaped her spirituality including the loss of her nephew Simon at age 11 in 1988, the loss of her nephew Alex at age 15 in 1999, and the loss of her son, Timothy at age 20 in 2010.